The worldwide leader in smart made simple computing accessories, Kensington Computer Products Group has introduced the world’s first USB-IF certified Wireless USB universal docking station, which incorporates 5 USB ports, DVI-I as well as speaker port for efficiently connecting to USB peripherals, external monitor and audio speakers without having to plug and unplug anything in your work environment, allowing an instant and seamless connection of your peripherals to your Wireless USB-enabled notebook. Ease of use and convenience – After the initial easy pairing process, the notebook automatically connects to the docking station as soon as it comes into range, instantly bringing your external monitor, audio speakers and USB devices to life, saving the time and hassle of plugging and un-plugging peripherals for increased productivity. Easy accessibility – Works with all Wireless USB-enabled notebooks. Added comfort of being able to work in an unconfined position unlike traditional tethered docks. The Kensington Wireless USB Docking Station is a wireless gateway between your new Wireless USB notebook and legacy USB devices: any device plugged into the wireless docking station can be controlled by your paired notebook wirelessly. DualView technology – Push a button to access second monitor in mirror or extended view mode to easily extend your desktop and increase productivity; DVI connection provides sharper images. Speaker connectivity – Connect external speakers to get better sound quality. Desktop clutter reduced – Reduces cable clutter with wireless connection between dock and notebook. 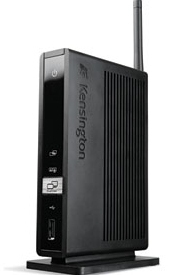 The new Kensington Wireless USB Docking Station is expected to be available later this month for about $230.